At this year’s National Ploughing Championships in Tullamore, Co. Offaly, McHale will be recruiting for a number of positions within the company on stand 331. These positions are right across the company which include Software Developers, Electronic Design Engineers, Human Resource Manager, Fitters / Mechanics and Experienced Welders to mention but a few. Below is an article from Mary Phelan of the Irish Farmers Journal newspaper which featured a few months ago. This article gives an understanding of the business and what McHale are about. McHale says 2017 “will be an exciting but busy year on the recruitment side”. Mary Phelan finds out why. We’ve just completed a 200,000 sq ft expansion. which is about five acres roofed,” says Paul McHale in the same tone someone else might say they’re popping down to the shop for a pint of milk. But this is par for the course at McHale, which has been a good-news story on the agri machinery front for many years now. 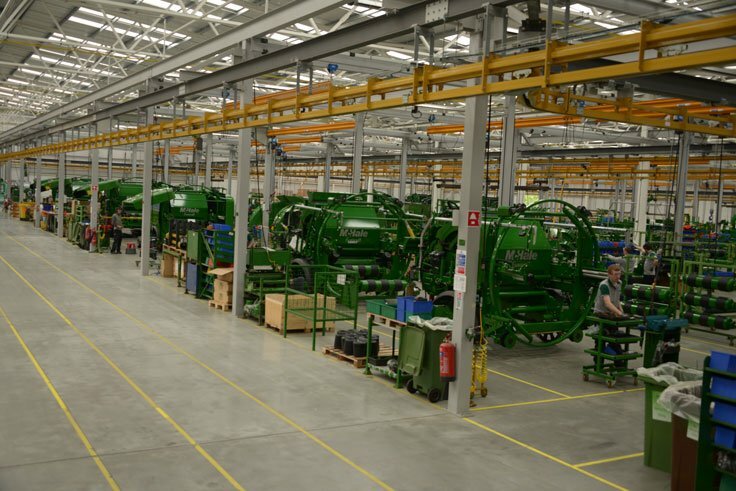 McHale makes a range of round balers and round and square bale wrappers at its headquarters in Ballinrobe, Co Mayo, where it has a 30-acre site with a seven and a half acre roofed factory. Paul predicts 2017 “will be an exciting, but busy year on the recruitment side”, as McHale expects to fill between 40 and 50 live roles in the company. These will be for fitters, welders, painters, assembly technicians, and product and market support engineer – to name but a few. McHale will also be looking for design and electrical engineers, and Paul says: “We aim to take on a number of people in software design and development.” This is on the back of significant recruitment in 2016 as well. McHale created 40 jobs this year, 25 of which were newly-created positions across a number of different areas. The roles McHale had the most difficulty filling this year were around the areas of electronic engineering and software development. “Gradually, we are getting the right people on board, but it is a slow process” says Paul. “When you say software, a lot of people think of Google. They don’t think of a baler or a bale wrapper. There’s a lot of automation and software involved in what we do to make machines fully automatic. “When software people come in and see what we’re doing – to someone with the right background, particularly someone with an interest in farming, or an interest in machinery – it can become quite exciting. we start with sheets of steel. A lot of the companies on the continent tend to be assembly plants, where they buy in painted assemblies, put them together and ship them. But we start with our raw sheets of steel. “The 3D designs from research and development are converted into flat drawings, which are cut on state of the art laser cutters. The flat parts then go down through the press brakes, where they can be bent and formed. The parts are welded together into sub assemblies, and then they go through a state of the art e-coat painting plant. The parts are dip-painted first, and then they’re powder-painted. That e-coat painting plant is very similar to how car components are painted. “From there, the finished painted parts pass into a 140,000 sq ft purpose built assembly hall. For assembly, we start with a basic chassis and then the parts move up along the production line. At each station, additional parts are added and the machine takes shape. At the end of the line the machine is fully assembled. “We run, test and calibrate every single machine and only then are the products shipped to the different worldwide market,” explains Paul. Given McHale sells to so many different markets, it needs to test its machines out in different terrains. Travelling around the world, testing machines for McHale is exactly the kind of work some of those working for McHale are engaged in. “This year we had people in Poland, France, America and Scandinavia. As we speak, there are three people in New Zealand doing product testing on new products on farms and in fields. Contractors determine how the product performs in different climate conditions and different crop types,” says Paul. Not only are there plenty of jobs at McHale but because the company is growing strongly, there is a lot of room for people to move up the ladder too. McHale’s head of R&D, Donal Collins, manages a team of 27 people in that area. He started with the company in 1996 as a junior design engineer and worked his way through to manage the department. On the technical service side, Ger O’Shea graduated from Tralee IT in 1999 and started his career with McHale as a product support engineer in the UK. After 10 years, Ger moved back to Ireland to manage worldwide technical service for McHale. Ger now manages a team of 15, who provide technical support and training to the markets in which McHale operate. There are other staff members who started apprenticeships on the factory floor in the early to mid 1990s and who are now in senior management positions. “These guys are all under 40, have been fundamental to the company development and will continue to grow their careers as the company grows,” says Paul. McHale will be taking on new apprentices in the new year. The company has been working with Solas on the development of a new apprenticeship scheme, and Paul says: “The faster it becomes available the better.” One of those schemes is Original Equipment Manufacturer (OEM) technician apprenticeship, which will allow people to develop their skills in electronics, wiring, hydraulics and product design and assembly. According to Paul, it should allow people to move into product and market support and testing roles. These apprenticeships are Level 6, and they incorporate on-the-job training and a block release for college. So this is what McHale has to offer – but what does the company want to see in you? “Overall, we’d have a lot of people with an interest in farming working here, a lot of the people would be farming part-time, so they’d have a strong interest in our industry,” says Paul. “For the ideal candidate to come through the door here, they need to like a challenge. They need to have a strong interest in machinery and that helps them understand what we do. “As the old saying goes: ‘If you love what you do, you will never work again,’ says Paul.